Update: Today being home alone I made this for the second time following my recommendations above. Without the flavour sachet the soup was much less salty and tastier, particularly with the Harissa – which might even be increased to closer to a half teaspoonful. I needed no salt, but delight in pepper which i confess to having used liberally- which only made it even nicer. I ate three bowls full! This recipe is now so much better than ‘hiking meals’ – I urge you to try it. 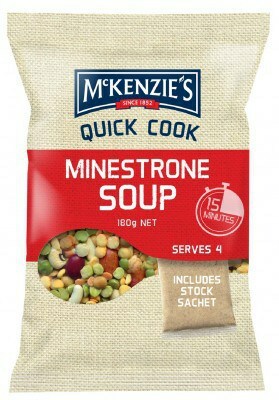 You may have to use the vegetable mix in a different Mckenzie’s ‘Quick Cook’ as locally the Minestrone flavour is becoming hard to source. Damn!